It was my boyfriend’s birthday last month. The big 3-0. Yes that’s right 30. I wanted to make him a cake, but what to make and when to make it? Since he’s started working days instead of nights we work practically the same hours. Nightmare. He’s practically always getting in the way now! He likes fruit cake (yuk!) so I thought I might as well make a fruit cake then I could make it in advance whenever I got the chance. Thing is, I’ve never made fruit cake before… that’s Mum’s forte. So is cake decorating now you come to mention it, eek! Anyway, I took my chance when he was working a Saturday in the Christmas/New Year period. I made a smallish fruit cake (about Victoria sandwich cake size) and several miniature fruit cakes in a muffin tin. I kept some of these back for decorating and left the others in a cake tin in the kitchen. For some reason I didn’t see him when he got home and I had a phone call asking what the ‘Christmas buns’ were for, I said he could have some if he wanted and the cheeky monkey says ‘Good I’ve already had two!’ -at least he liked them and the first attempt at fruit cake wasn’t a disaster! He totally had no idea about the secret birthday cake though! Ha! 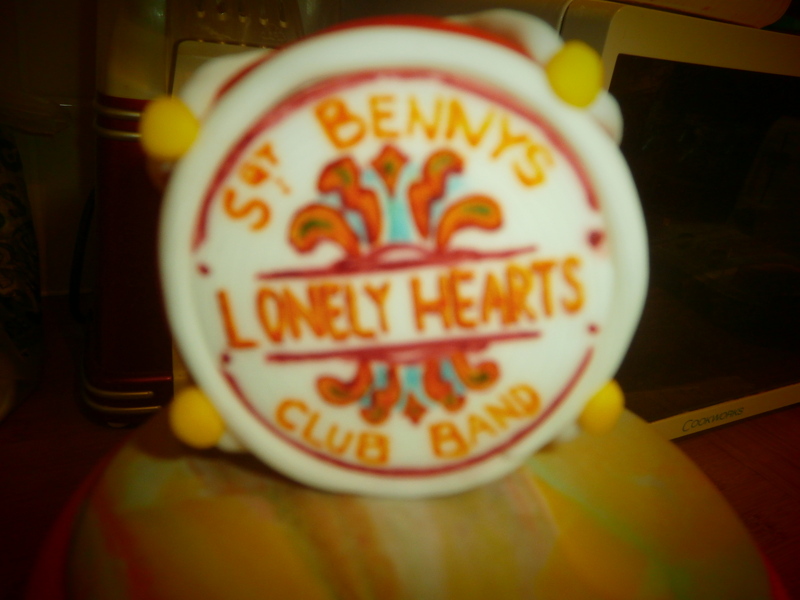 I went for a Beatles theme, Sgt Pepper era… I made little icing figures on lollipop sticks to stick into the cake closer to the time when I put it all together. The middle section was sponge (I told him I needed him to go out while I wrapped his presents!) -so I could have a slice (after removing the icing first -I’m so picky!) 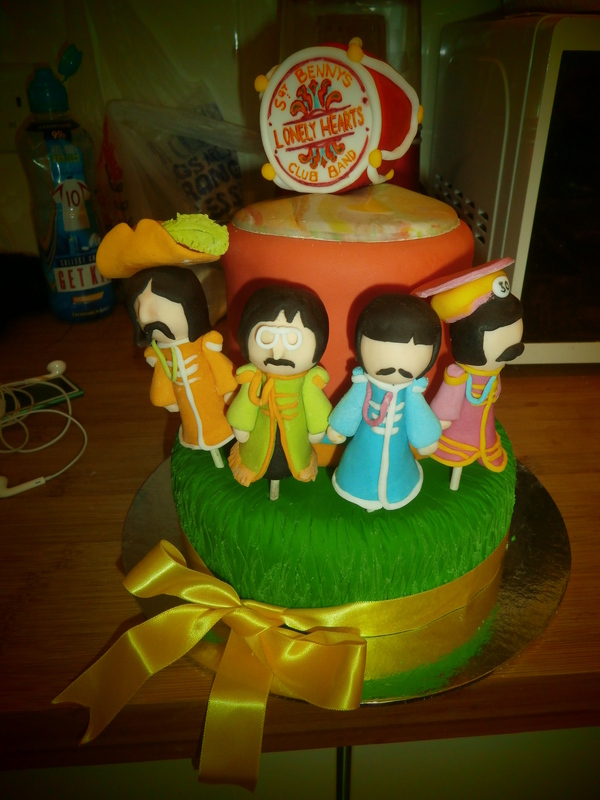 As I said, I’m not much of a cake decorator but what do you think?